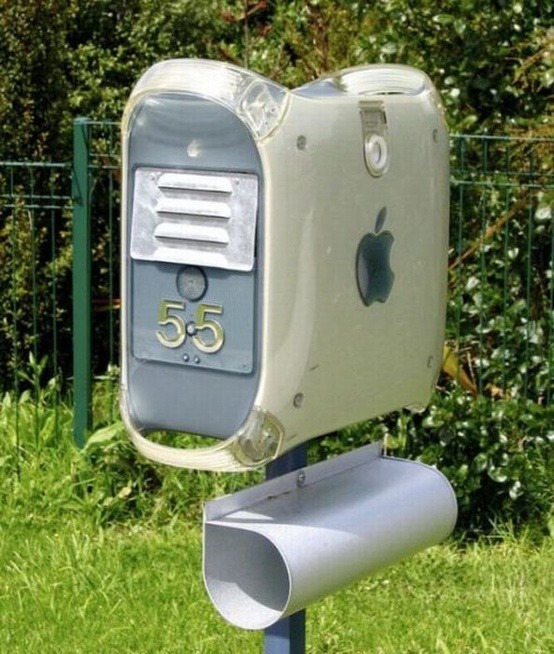 Have you ever seen a Mac mailbox before? If not, you are in for a treat. Seeing these old G3 and G4 Macs brings back so many memories. I remember I thought I was hot stuff to have a G4, and I used an external Jaz drive that felt like it weighed 5 pounds to backup my data every night. It’s funny how our perception of technology changes over time. It’s hard to believe the MacBook I’m typing on right now will be obsolete in a year or two. As you know, used computer equipment doesn’t have much resale value. What do you do with your computers when you upgrade? Most people I know either give them to less fortunate people who need them, recycle them into something else, or keep them in the back of a closet for sentimental reasons. After all, we get attached to our gadgets these days. I recently found my iBook in a closet, and I was flooded with special memories. If you take the recycling route, what will you make? There is the classic Mac coffee table which is probably the easiest thing to do. You just put it in your living room and throw a tiny tablecloth over it and voila…you’ve got useful table. If you can muster more creativity than that, you could even get fancy like the guy who created this Badass Table Made From Old G4 Computers. Perhaps you want to create a statement outside your home where everyone can see your beloved old computer that was so special for so long. In that case, you might consider making a Mac mailbox. If that’s not your style, then surely you’ll like the Beer Server G3 below. I want to make a beer server and a Mac mailbox…now I just have to find my old G3 and G4. Maybe the Beer Server G3 is more your style.